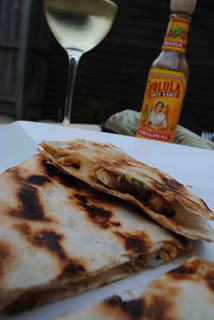 Not that you need a recipe for a quesadilla, but for whatever reason, I never would have thought of this combination of ingredients until I saw it on Fake Ginger. We happened to have some chicken in the freezer that we pulled out to use in this dish. On her site, Amanda gives a rough guideline of the ingredients to use, without any measurements. Below, I have written the recipe the way we prepared the quesadillas, however, feel free to prepare them whichever way you see fit. After grilling them, we enjoyed them in our backyard with a side of yellow rice. This is such a quick and delicious meal that I see becoming a staple in our house! Cook the chicken, according to your liking (I grilled, but baking or parboiling would be perfectly fine). In the meantime, chop the onions and place them in a foil packet on the grill over low heat. When the onions and chicken are done, remove them from the grill. Shred the chicken with 2 forks into a medium sized bowl. Pour the barbecue sauce over the top and mix to coat all chicken. Line the grill with a piece of tinfoil and spray with non-stick cooking spray. Place 2 tortilla shells on the foil and top with chicken, onions, about 1/2 cup of cheese each, and a little bit of cilantro. Top each with another tortilla shell and spray the top with a bit of non-stick cooking spray. After grilling for about 3-4 minutes, flip the quesadillas and grill for an additional 2-3 more minutes on the other side. Repeat with the remaining tortillas and ingredients. Yields 4 quesadillas. Serve with additional barbecue sauce, for dipping (or hot sauce, if your name is Joel).